Essenti, located on one of the famous streets to eat in Vienna, is a London style designed coffee shop, reminiscence of Otto Lenghi with freshly made food served in huge platters and offering frozen yoghurt with fresh fruit toppings and of course coffee. It opened during the latter half of 2013 but already has a regular customer base. Whilst I’ll say they make a decent espresso, it’s probably the ideal place to get a good lunch to compliment an above average espresso. The owner, Marko, is very hospitable and warm and has a keen eye for detail. His shop is small, cosy but homely and welcoming with food prepared like home. There’s a lot of choice for a small place, with about 6 offerings of exotic salads, a daily quiche offering, two main dish specials and sometimes 3, small good-looking cakes and a huge array of nuts and condiments to top your frozen yoghurt, plus a whole list of drinks too. It’s not often that I eat food that feels like you didn’t eat anything – confused ? Yes! you should be. What I mean is that so often you go out to eat and after you’ve eaten you feel full, a slight indigestion perhaps, bloated and worse, heavy. BUT, when was the last time you ate out and you actually felt nourished – like the food contribute to your well-being ? Think about it – for me, it was the last time I ate at Essenti and for me the first time I felt like that was at Zaika, located at the very prestigious London address of 1 Kensignton High Street, London SW1 – a Michelin Indian/European Fusion Restaurant. But, back to Essenti. 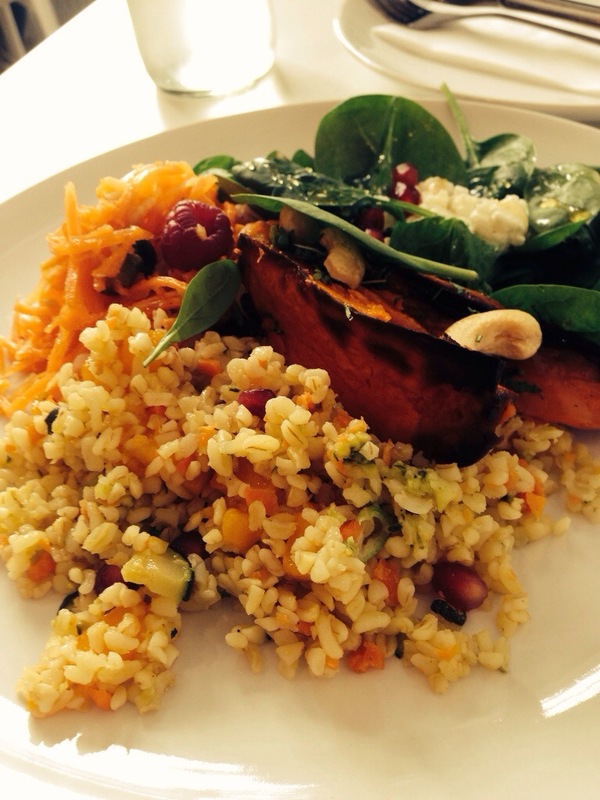 All freshly prepared with carrots, rocket (rucola), roasted sweet potato (my favourite), bulgur, decorated with raspberries, pine nuts, pomegranates and more. I finished off with an espresso naturally. But, if you don’t know me by now – followers of my baking blog www.atastyblog.wordpress.com do, I also love dessert. 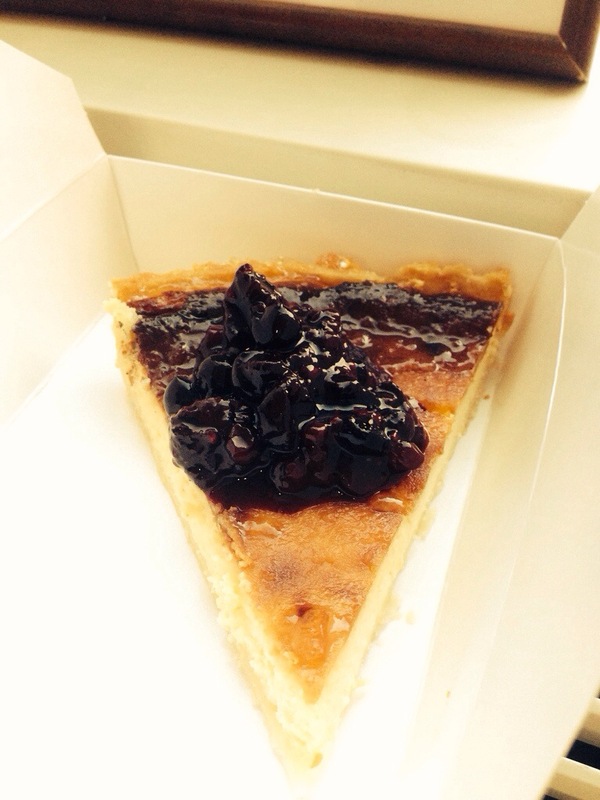 I didn’t have time for it, but I took it back to my office and shared a bit with my daughter who happened to be passing by – ricotta and quice pastry tart – yummy! with a berry coulis. OK! now that I got you drooling. You’ve got to check Essenti out – the food is great and for my standards, that’s a lot as I don’t usually use that adjective, ask my colleagues or the wife. I can’t wait to check out the frozen yoghurt when it gets warmer. Before I go, I’ve got to talk about the coffee. Using a La Marzocco 2 group Linea, with support from Mazzer grinders and coffee from probably the best coffee roaster in Austria, Vienna School of Coffee (I’ve written about them on my blog – plus see my last post) and trained by Jo (of the Vienna School of Coffee), the standard of the preparation is above what you get in Vienna. Marko has two blends – one for pure espresso and one for milk-based espresso drinks. Essenti is getting so popular that MArko now has to double his staff from 2 to 4 and I hope he keeps up the standard with the coffee too, so that it compliments the great food on offer. Open Mondays to Fridays only – so extended lunch breaks are your best option. 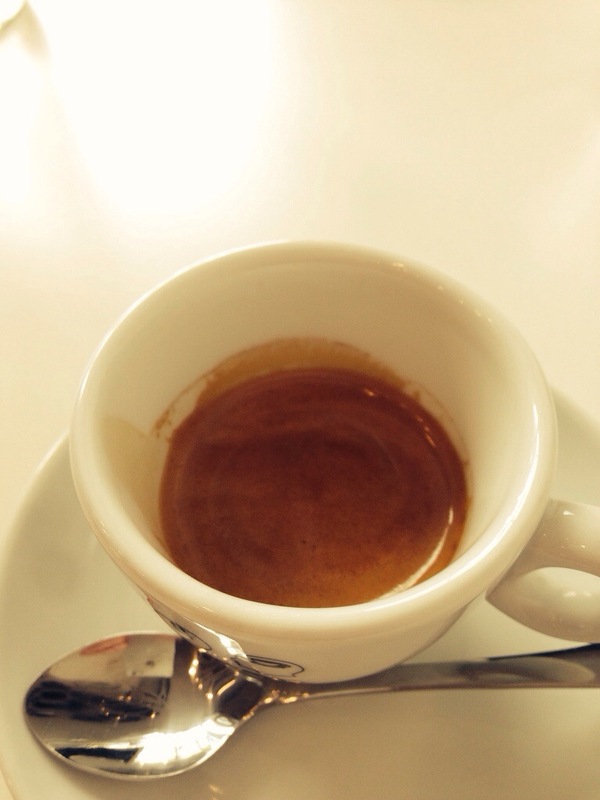 This entry was posted on Saturday, March 15th, 2014 at 6:36 pm	and tagged with espresso, essenti, La Marzocco, Otto Lenghi, Vienna School of Coffee and posted in Bean There - Cafes, Coffee News, Vienna Coffee Shops. You can follow any responses to this entry through the RSS 2.0 feed. 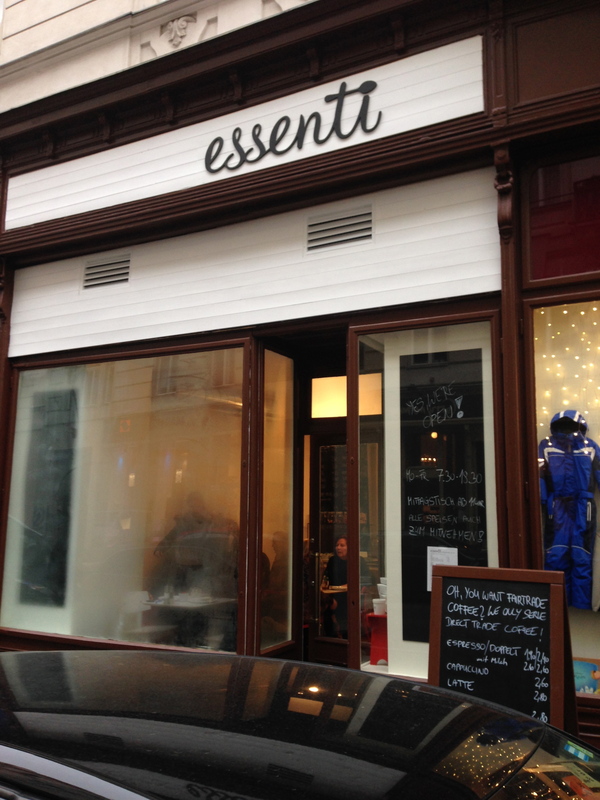 Lameen has shared an excellent article here about Essenti: A Marriage of Good Food and Coffee in Vienna. 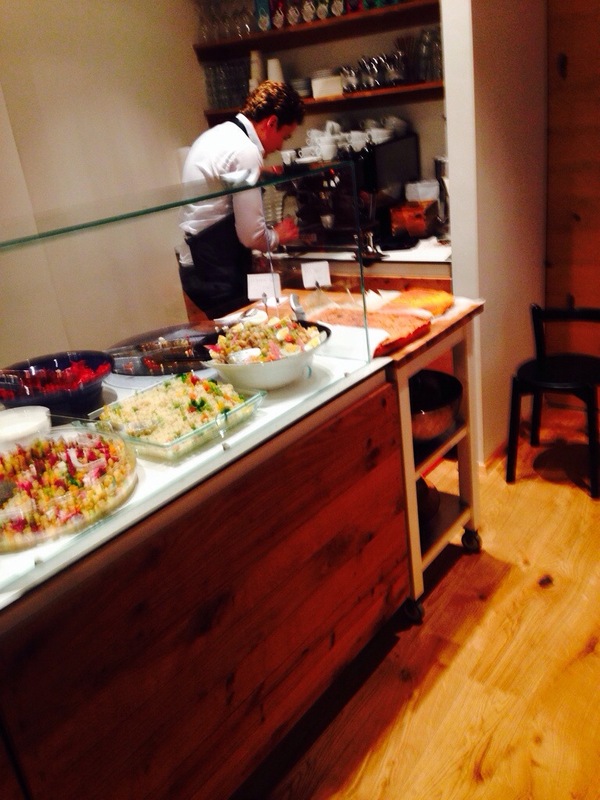 Yeah, It’s a great good food and coffee shop. I like the combination that Essenti made about food and coffee. It’s really very attractive.